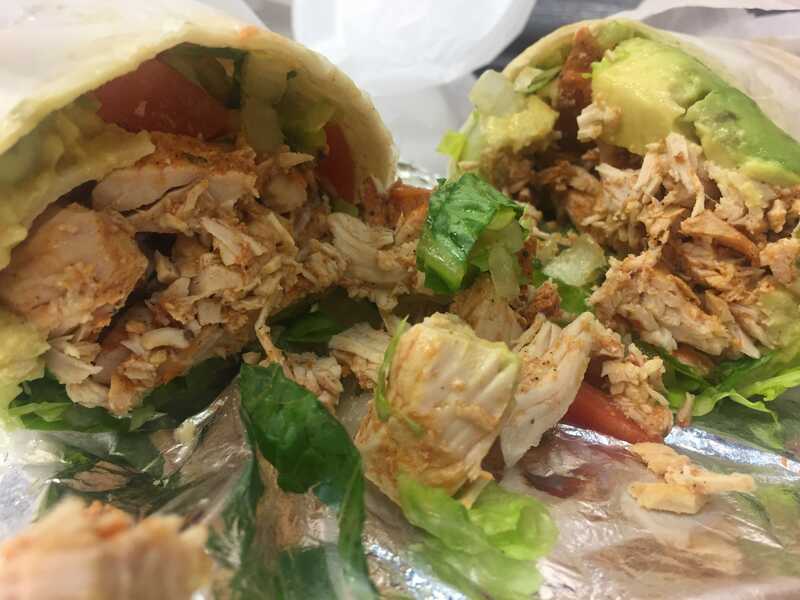 If you’ve ever attempted to break away from your busy work day and grab lunch in the middle of the day, you know how frustrating the tedious lunch lines can be. 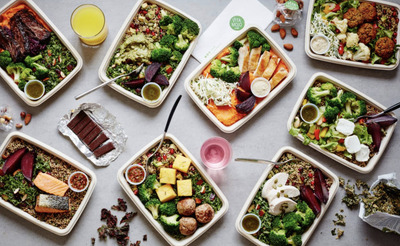 MealPal, a two-year-old company that received $US20 million in its most recent funding round, offers a lunch subscription plans that prices meals around $US6 a piece. 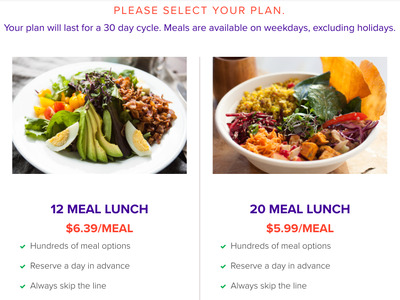 Once you sign up for MealPal with your email address and credit card number, you can choose between one of two 30-day lunch plans: 12 meals for $US6.39 per meal, or 20 meals for $US5.99 per meal. 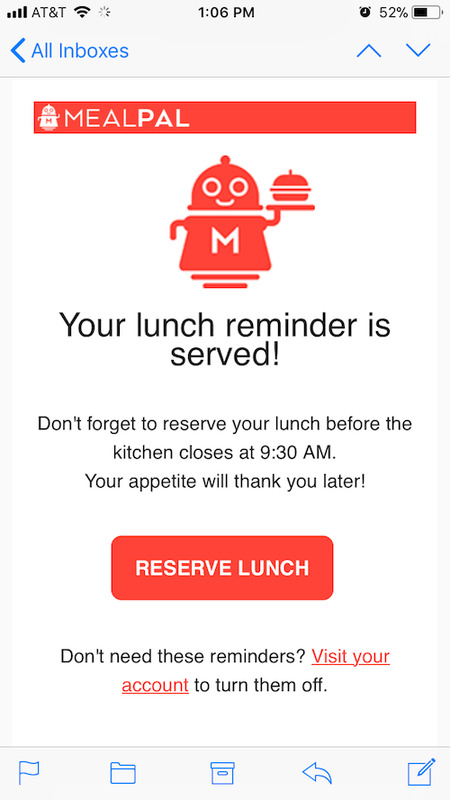 As a MealPal subscriber, you’ll be sent an email each morning to remind you to order your lunch before 9:30 am. 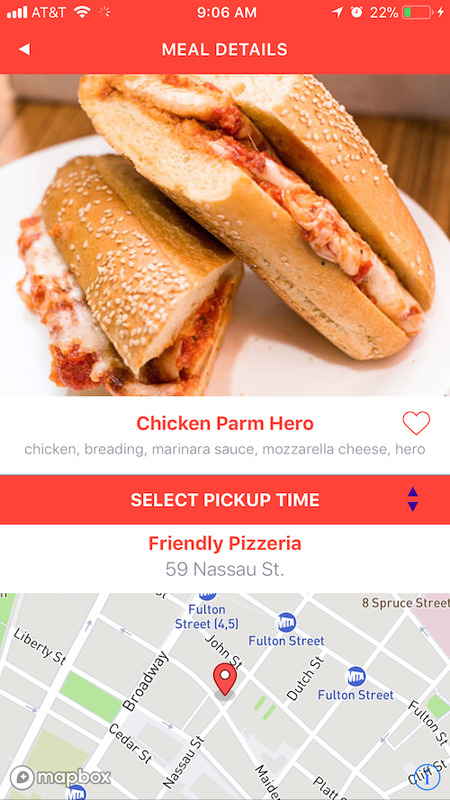 While most restaurants MealPal partners with only let you order before 9:30 a.m., there’s a select few that will let you order as late as 1:30 p.m. 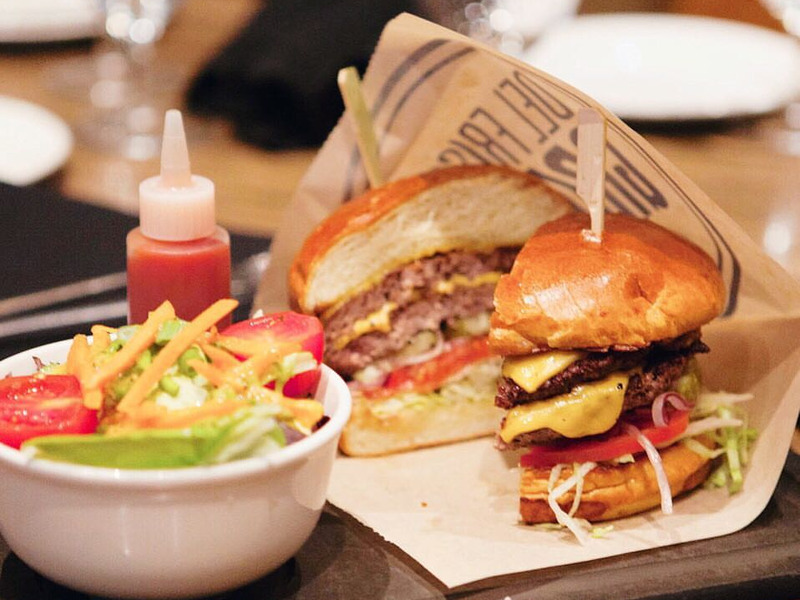 The drawback to ordering after 9:30 a.m. is that your pickup time is rigid. For instance, when I selected a 12:30 p.m. pickup time but later realised I had a meeting at the same time, I went into the app to change my pickup time. 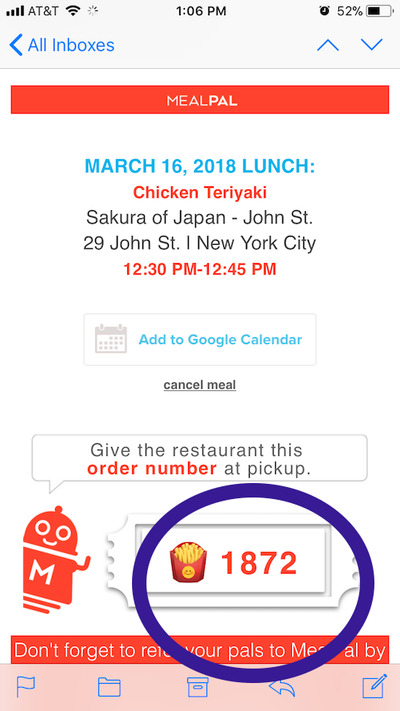 MealPal left me only two options: either pick up at the time I had originally selected, or cancel my dish – although the meal would still count toward my subscription plan. 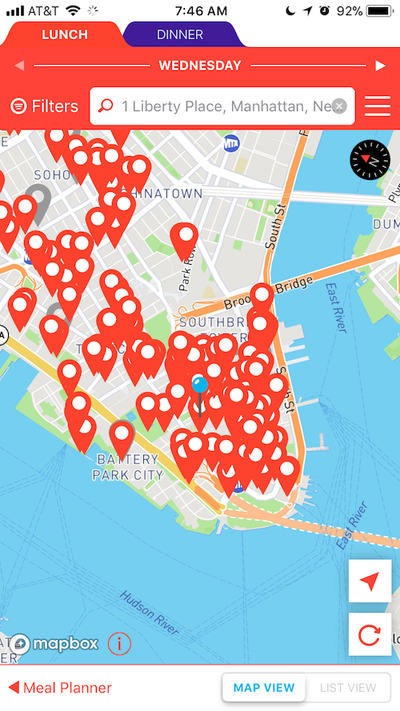 Open the app, and you’ll be brought to a map marked with all of the places where you can order lunch. 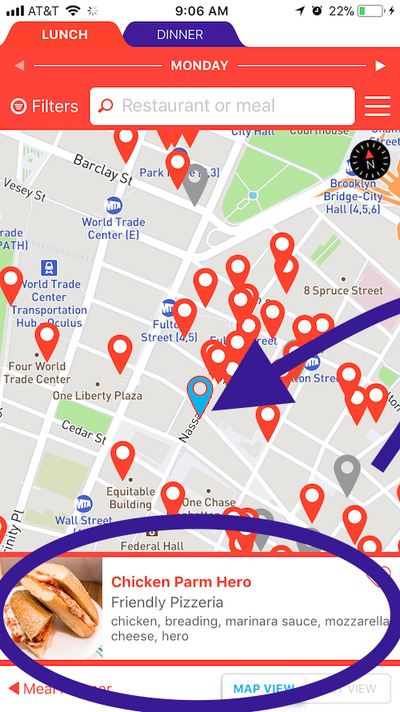 Business Insider’s location is in prime restaurant territory, making it easy to try a variety of different meals. When you click on the red icon, you’re shown a picture of the restaurant’s lunch offering for the day — for instance, this Chicken Parm Hero being served over at Friendly Pizzeria. Once you’ve selected your meal, you can choose the time you’d like to pick it up in 15-minute increments. MealPal isn’t a delivery service, so you’ll have to go and pick up your lunch yourself. 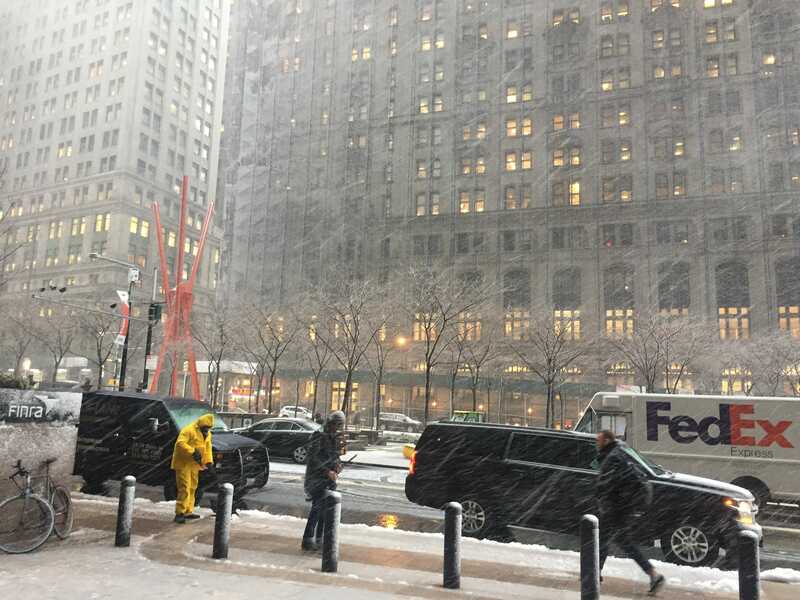 The first day I used MealPal, there was a blizzard in New York, but I bravely ventured forth. 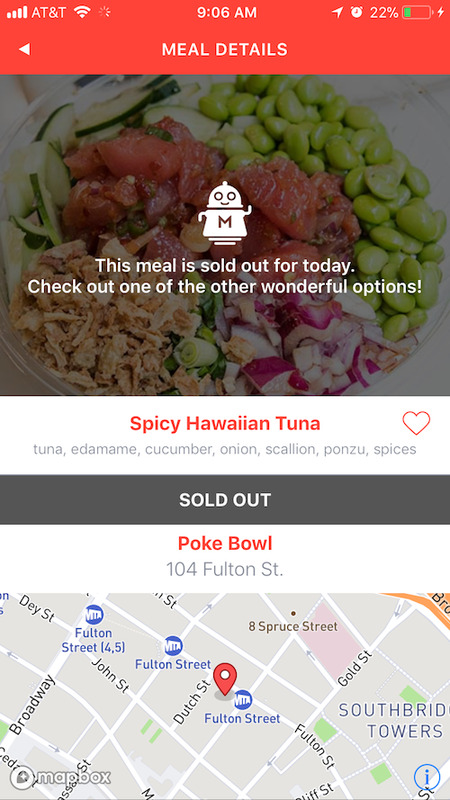 One of MealPal’s biggest perks is that you can skip to the front of the line. There’s no fumbling with cash or credit cards, either. Simply head to the front of the restaurant, tell them you ordered with MealPal, and present your confirmation number. They will hand over your food. Admittedly, my food wasn’t always immediately ready. During the few times I used MealPal, I typically waited around five minutes or so for each order. 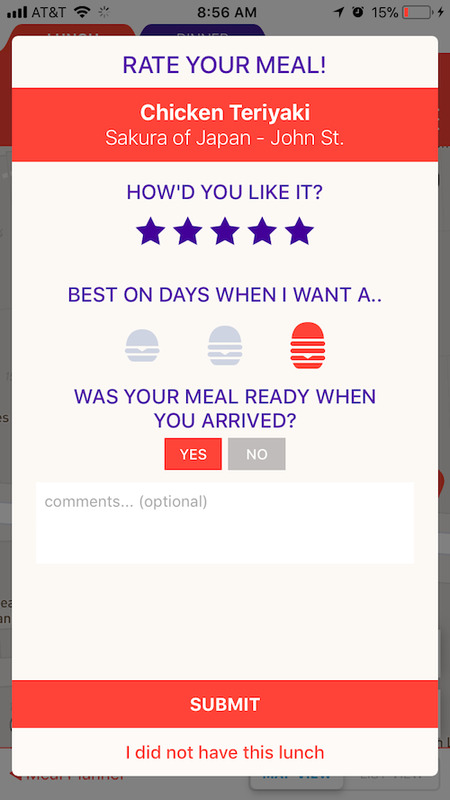 My first MealPal lunch was a disappointment. 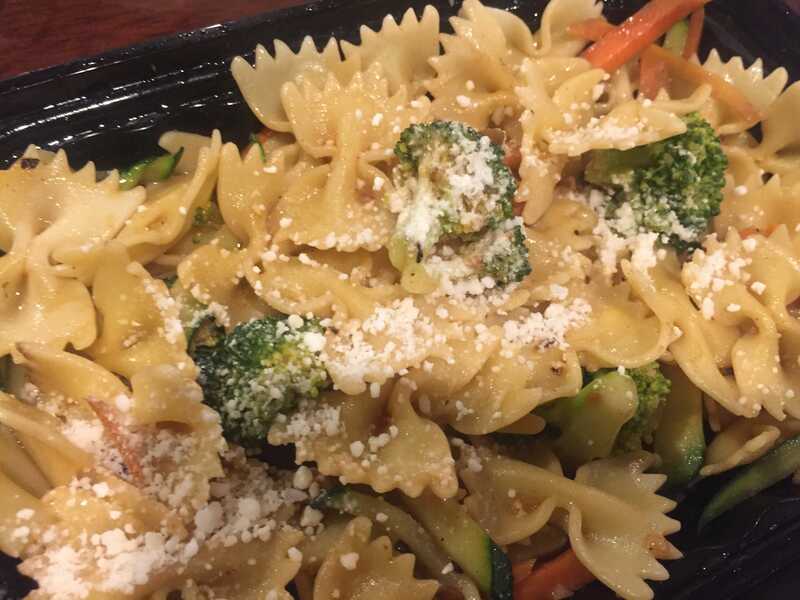 While the dish itself wasn’t very good, I think what bothered me most was the portion size — I was still hungry after I finished. 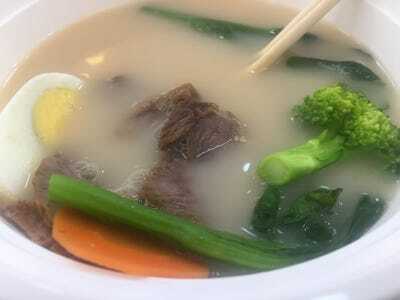 In my opinion, this dish wasn’t worth $US6. 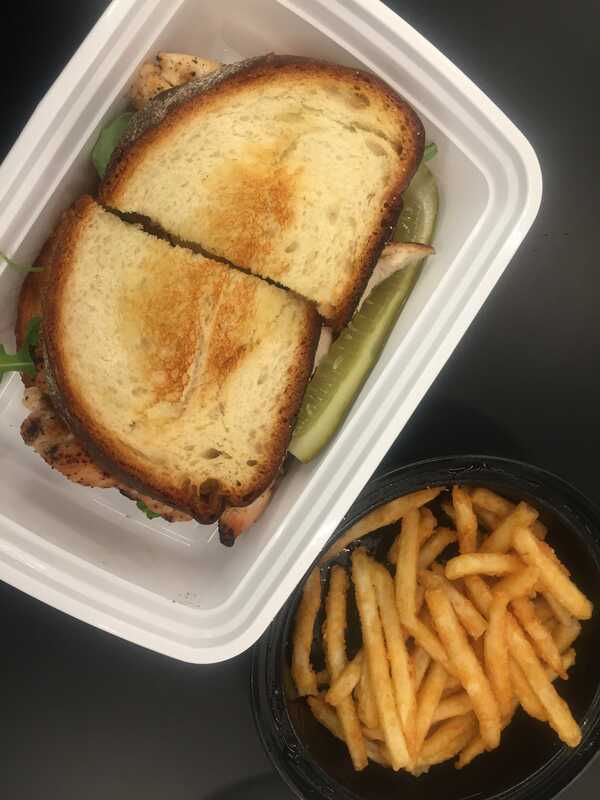 The next day, I ordered a chicken club sandwich with fries from a grill downtown. It was delicious and filling — and for $US6, a really great deal. While this wasn’t the best ramen I’ve ever had, it cost about one-third of what I usually pay for ramen in New York. It was warm and filling, but lacked flavour. This was true of the other MealPal menu items offered as well. 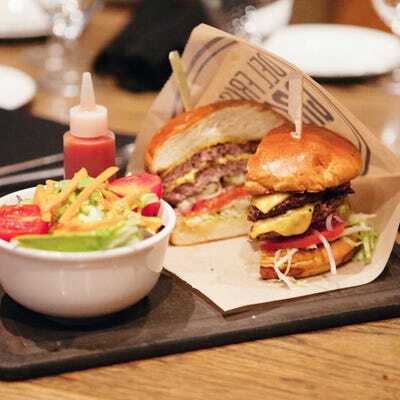 Typically, the dishes offered through MealPal are priced $US2 to $US3 higher on the restaurant’s regular menu. If you’re looking for a particular meal, there’s a way to refine your search options as well, including choosing how much food you actually want. 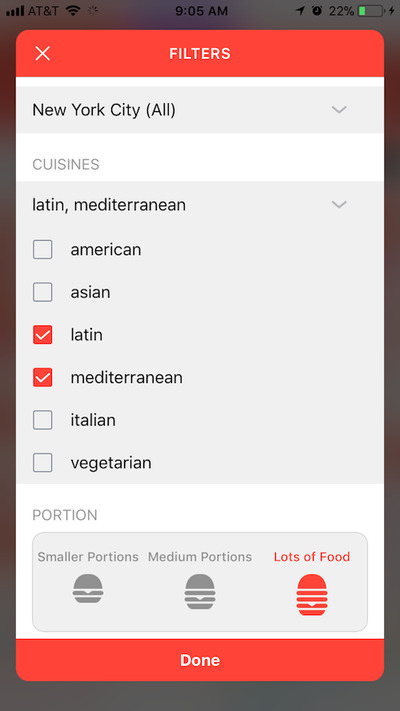 For now, you can filter your meal options on the app under vegetarian, but your options might be more limited if you’re eating gluten-free, kosher, or vegan. MealPal says they have plans to add more filters in the future, but the ability to modify a meal probably won’t be an option any time soon. 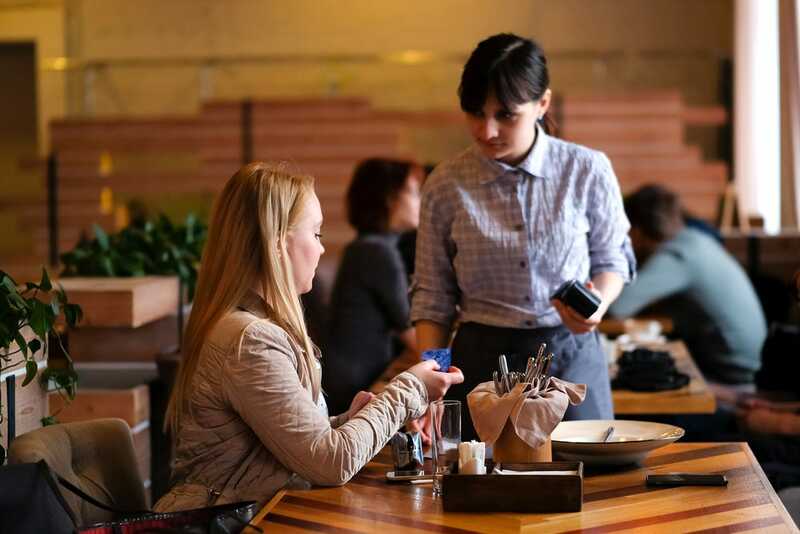 In order to keep the MealPal process streamlined, it’s essential that restaurant orders don’t involve customisation. One restaurant owner who asked to remain anonymous said the only downside was that they were offering their menu items at a significantly reduced price. However, they did say they weren’t losing any money on the product, and that the ease of using MealPal made it worth it. 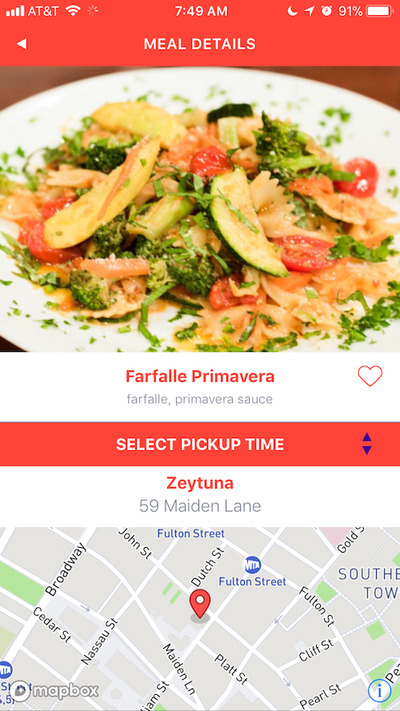 While I wasn’t a huge fan of my initial experience, ultimately, I really enjoyed using MealPal. Aside from its affordability and ease of use, I also ended up trying a number of dishes I wouldn’t have otherwise ordered without MealPal. Ordering a new lunch every day and venturing into a new restaurant was an enjoyable break in the middle of the work day, and my pickup times never took me more than 15 minutes in total. MealPal made a lot more sense than the way I’d previously ordered lunch during a work day, which often involved leaving the office famished and hunting out the shortest lunch line. In downtown Manhattan, it’s not difficult to spend as much as $US15 on lunch, and to have a number of different options at my fingertips for one-third of that amount seemed like a really good deal. 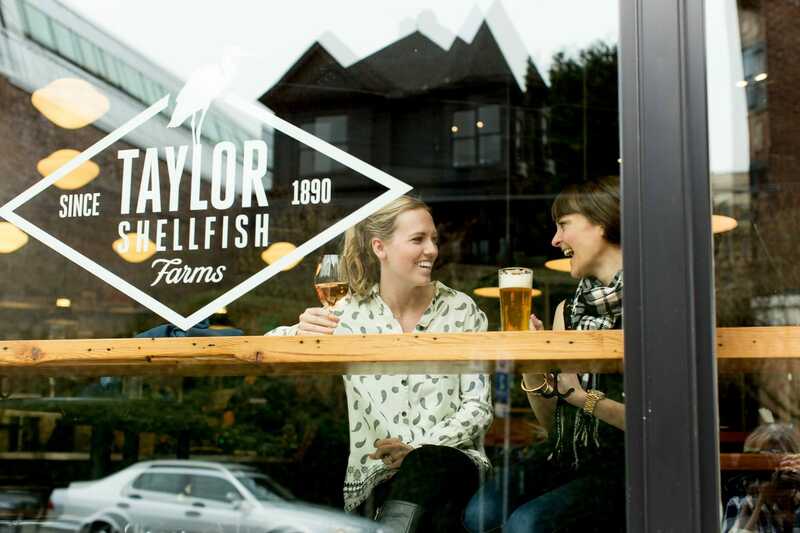 MealPal is offered in more than 14 different regions around North America. You can see if it’s available near you, or learn more about the service, <a href=”https://mealpal.com/”target=”_blank”>here</a>.